Last night I was planning to make fish and then this idea came to my mind that instead of making fried fish I should try to make it in a different way. So I marinated fish with few ingredients and grilled it and then top it with white sauce with mushrooms and it tastes great with fried rice. 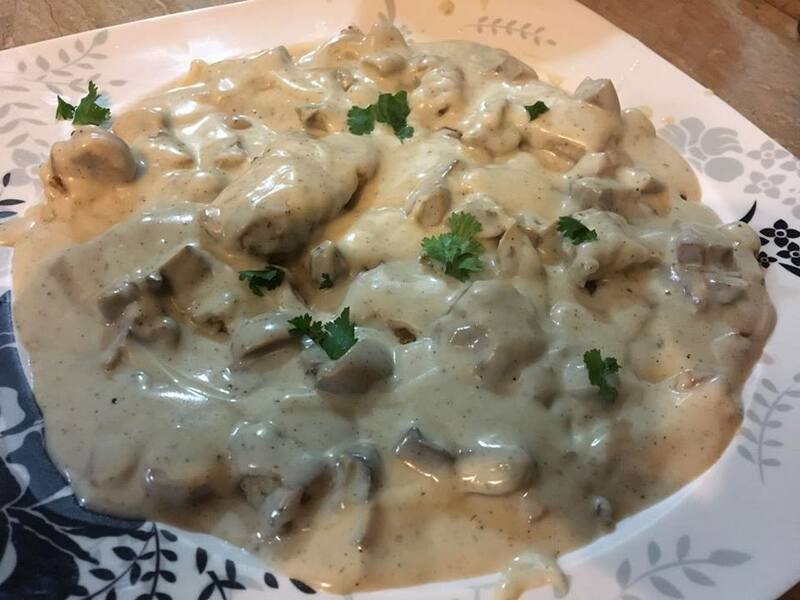 This is my own recipe of fish in white mushroom sauce and its texture is very creamy and soft. Hope you all will love it. Marinate fish fillets with salt, black pepper, olive oil and lemon juice and leave it for one hour. Now pour a little oil in grill pan and grill fish from both sides until it is tender and cooked. Set it aside. Melt butter in a saucepan over low heat; stir in flour. Stir and cook for about 2 minutes. Do not brown. take off from heat and then gradually stir in milk and continue cooking over low heat, stirring constantly, until sauce begins to thicken. Season it with salt and white pepper. Saute mushrooms in butter and add it in white sauce. Now pour white mushroom sauce over fish fillets and serve hot with fried rice.